This simple, speedy curry is prepared using a store-cupboard ingredient - ready cooked tinned Puy lentils. The lentils combine with ginger, garlic and spices and are then topped with hard-boiled eggs for a filling, hearty meal that is sure to please all the family. Hard boil the eggs - place them into a pan of cold water and bring to the boil before cooking for ten minutes. Remove from the pan and put into a bowl of cold water. Set to one side whilst you cook the curry. Finely chop the onion and mince the garlic and ginger. Roughly chop the tomatoes. Heat some oil in a heavy pan and fry the onion until it softens but does not brown. Add the garlic and ginger and fry for another minute. Add the tomatoes and spices and cook on a low heat for another five minutes. Add the lentils and the water to the pan and cook for another five minutes or so. Whilst cooking, peel and slice the eggs. Serve the curry in bowls with the eggs arranged on top. For extra flavour, try adding some freshly chopped coriander to the curry. A freshly chopped chilli would also be a great addition if you like your curries a little bit spicier. This recipe serves four people. 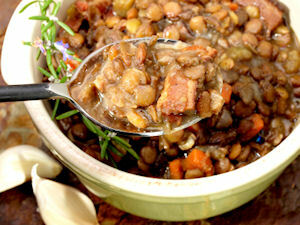 Back to the Lentil Recipes home page.